IRS Form 6252 is a U.S. Department of the Treasury - Internal Revenue Service - issued form also known as the "Installment Sale Income". 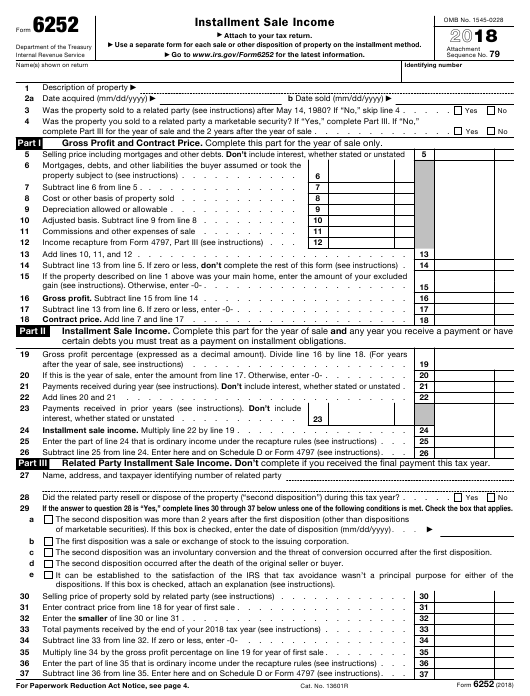 Download a PDF version of the latest IRS Form 6252 down below or find it on the U.S. Department of the Treasury - Internal Revenue Service Forms website. Total payments received by the end of your 2018 tax year (see instructions) . investment is held for at least 10 years. determined, basis is recovered ratably. debt immediately before the refinancing. someone related to the creditor. still outstanding at the close of a tax year. received before 2018 from the sale. IRS Form 1041 2018 Schedule K-1 - Beneficiary's Share of Income, Deductions, Credits, Etc. IRS Form 1065 2018 Schedule K-1 - Partner's Share of Income, Deductions, Credits, Etc. IRS Form 1120S 2018 Schedule K-1 - Shareholder's Share of Income, Deductions, Credits, Etc.